Please take a moment to watch this video highlighting Friends' two year partnership with the Illinois Department of Natural Resources (IDNR) to create channel catfish habitat in the Chicago River system. Developed to help this critical species repopulate the river after years of degradation limited its breeding success, the channel catfish project included the installation of 400 constructed nesting cavities, designed by Friends and IDNR, and the release of 277,000 juvenile channel cats that will grow up to use the nests. Friends of the Chicago River has been working for over three decades to improve and protect the Chicago River. At the foundation of our efforts and essential to the recovery of the Chicago River is improving the quality of its water and the habitat along the banks of the river. We have seen great changes along the river and are proud to be part of the success. Historically serving less glorious purposes the Chicago River has been excavated, straightened, and reversed. It was used a sewage canal, a shipping canal, and perhaps most famously, as a dumping ground for the Union Stockyards, once the largest in the world. After over 30 years of advocating on behalf of the river, nearly 70 species of fish, countless species of birds, and wildlife such as beavers, muskrats, turtles and now even river otters, call the river home. Although the Chicago River still needs improving, it is already a wonderful natural, recreational, and economic treasure that is rapidly expanding its role as a vital resource for Chicago and the other communities along its banks. We want to share some of our success stories in recognition that this kind of work takes years of perseverance, lots of partnerships and collaboration, and a belief that the river is worth investing in. Take a moment to celebrate our successes. 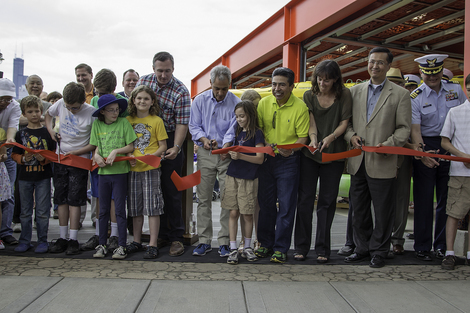 In celebration of the new boathouse at Ping Tom Memorial Park along the Chicago River.